Guy’s Cliffe, a large sandstone bluff towering above the River Avon and surrounded by woodland, has been the subject of romantic legends and myths for many centuries. Whatever the truths and realities of those stories, the site and the nearby water mill have certainly been inhabited since before William the Conqueror came to our shores. 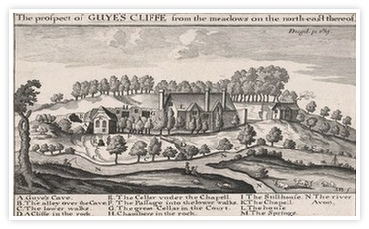 In its earliest days, Guy’s Cliffe was a religious site having close associations with Warwick Castle and St Mary’s Church. 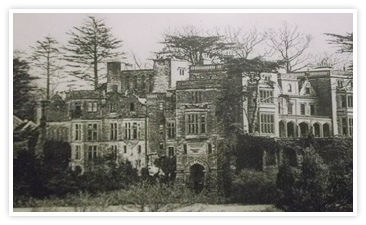 In Tudor times a fine country house was built and this was later replaced by a Georgian mansion as more land was acquired and Guy’s Cliffe developed into a substantial country estate. In its heyday, Guy’s Cliffe saw more than its fair share of drama and tragedy as it passed through the hands of a succession of influential and powerful families who were known across the country, Europe and beyond. Our particular interest is in the walled garden that was created to support the estate and in how the history of the garden is intrinsically associated with that of the house and the families who lived there.